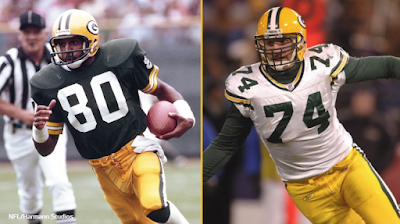 GREEN BAY – Pro Football Hall of Fame receiver James Lofton and two-time Pro Bowl defensive end Aaron Kampman will announce the Packers’ Day 2 picks at the NFL Draft on Friday, April 26, in Nashville. For this year’s draft, the NFL is having former first-round picks announce their team’s second-round pick, while players drafted in later rounds will read off the third-round selection. The Packers are scheduled to pick at No. 44 in the second round and No. 76 in the third round. Lofton, the sixth-overall pick in the 1978 NFL Draft, led the Packers in receptions in all but one of his nine seasons in Green Bay. He ranks third in franchise history with 530 catches and second with 9,656 receiving yards. Kampman, a fifth-round pick out of Iowa in 2002, ranks fifth in franchise history with 54 sacks. He made back-to-back Pro Bowl appearances for the Packers in 2006-07. Both players also will be on-site to mentor the prospects and give back to the city of Nashville through participation in a variety of community service events. Pro Football Hall of Fame guard Jerry Kramer and former linebacker Brad Jones announced the Packers’ Day 2 picks last year.